Jordan Peele’s Us is more tension than horror. 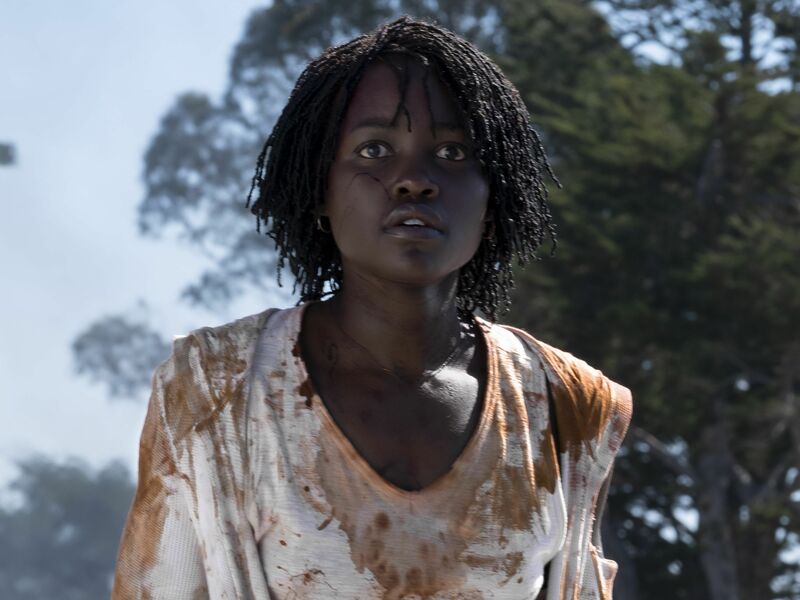 The box office-hit follows Adelaide (Lupita Nyong’o) and her family’s terrifying journey as the four come face to face with their doppelgängers — referred to as the “tethered” in the film. There’s the imposing copy of father Gabe (Winston Duke), all brute force and flared nostrils; a teenage look-alike of daughter Zora (Shahadi Wright Joseph), her head slightly bowed with a full, unnerving smile on her face; a snarling, growling feral version of son Jason (Evan Alex), rarely seen without a mask; and Adelaide’s wide-eyed, gruff-voiced other. These four are cunning, silent, and, it seems, much stronger than their upper-middle class counterparts. As the film’s plot races towards answers for why they exist, the tension repeatedly rises and falls. The film’s startling soundtrack, helmed by veteran composer Michael Abels, acts as a storyteller in its own right, imbuing each scene with an unsettling feeling that lingers until the very end. Abels handled the “gospel horror” of Get Out after Peele discovered him on YouTube. And the success of Get Out carved out a special space for him in the movie industry and Peele’s inner circle. “He has given me a full chance to express my creativity within his vision so any time that I get to work with him, it has been blessed territory,” the composer tells MTV News over the phone. MTV News spoke to Abels about the sounds of Us, the choice to use “I Got 5 On It,” and what would he do to his own doppelgänger. MTV News: How did your approach to composing music for Us differ from Get Out? I read that for Get Out, Jordan Peele provided you with a script and you created music based on that. Abels: Jordan likes to hear music in pre-production, before he’s even shot any film, because it helps him to design the sonic world of the film as well as the visual world. The difference here is that it was a different story and the music has to identify with the characters in this film and tell their story. He wanted me to experiment with duality in music, just because duality is an overarching theme in the film itself. Instruments that normally don’t go together. There’s a solo violin, but there’s also a cimbalom (a kind of instrument that looks like a piano but is played with hammers). There’s a track where a kalimba, berimbau, and didgeridoo are playing together and they are all from different cultures, so there was a lot of experimenting with traditional and nontraditional sounds specifically to come up with the sonic palette for Us. MTV News: The cimbalom became Umbrae’s (Zora’s doppelgänger) defining sound. Did you find have other instruments to serve as opposites for other cast members? Abels: Not as specifically as that one because it seems like there are decisions that happen as a result of working on the film and it’s not like I said, “OK, I have these four characters and this is her instrument, this his instrument…,” and so forth. I could start out that way, but then the film evolves and different scenes need different sorts of music and that would be too restricting. The cimbalom seemed to work really well in the scenes with Umbrae and her smiling mischief. Another thing is that there’s a solo violin and that happens a lot over Red, which is Adelaide’s doppelgänger, and the violin somehow had a very good way of expressing Red’s quest for justice. So there’s a menacing malevolence to her, but there’s also a freedom of spirit that she has. The violin was very good at balancing those two feelings. MTV News: What do the tethered represent to you? How did you look to reflect this in the music? Abels: Jordan doesn’t give people a specific example of what the tethered represent because he wants the audience to be able to participate in the process of deciding what metaphors resonate best with them about the film. The tethered are people who don’t have opportunities in their lives. They are restricted in their ability to function as fully independent individuals and have access to things that we have that we take for granted. If that reminds you of anyone, whether its a group in society or yourself, that’s sort of the idea that’s in the realm of what this film is talking about. I think anyone can identify, in their own lives, times where they haven’t been free to express themselves or haven’t had the opportunities that others have had. One of the great things about the film is that because you can identify with the characters on some level, not only are you terrified of them in one sense, you can empathize with them on another. That’s one of the beautiful dualities in us, one of the many dualities that are present. There are times that the music empathizes with them and is not terrifying but, in fact, lonely and isolated. Particularly, the track called “Human,” where you’re in the underpass and you see their world. There’s some empty low sounds of wind whistling through an empty cavern, sounds we call “ambiance,” that are musical but are in the background creating a kind of sonic environment. Then there are voices. There are a lot of voices in the score and at that point, they aren’t even saying words, they are just kind of moaning in a very anguished and lonely way. All these things are designed to create the feelings that the tethered have and why they act the way to do. MTV News: Where did the inspiration come from for “Anthem“? Abels: It came from my original conversation with Jordan about the type of music that he wanted to hear in the film. He decides this idea of duality, and the second thing that he said to me was that he wanted to start the film with children’s voices. In his films, one of the things that he’s really known for is taking something that you think of in one context – usually, that context being very sweet innocent or happy — and recasting it with images that cause you to look at in an entirely different way. So with children’s voices, we would think of them as being very sweet and innocent, so he wanted me to start with that and show people that children’s voices can be very scary and disturbing. The thing that you need to get from “Anthem,” as an audience, is that there are a group of people and they are organized, so the tune is sort of like a battle cry. You hear this very march-like, militaristic music and you can tell that this group of people have an evil intent even if you can’t understand what they are saying. But then, also it’s important for this battle cry to not sound like it’s coming from some culture other than our own. So rather than a militaristic Western march, the beat drops and it’s really funky and goes against the voices, not with it. It’s made up of drums from a bunch of different cultures and that was my way of letting people know that this is a march for the people of all the people. MTV News: Who would you say are the villains of the film – the humans or the tethered? Abels: That’s the whole nature of the film: The tethered are human, and that’s the most important thing to understand about them. They are not aliens. They are us. The film makes it unclear how much they are separate from us and how much they are literally a part of who we are. You’re meant to come away asking that question. To me, I think the answer is clearly both. MTV News: If put in the same situation as Adelaide, would you kill your doppelgänger or let them live? Why? Abels: That’s such a great question. Well, one thing about Jordan’s storytelling, and something I think is key to his brand, is that his characters act as any normal person would do in incredible situations. For example, they call the police at the beginning and not at the end. And they say humorous things, very darkly humorous things in upsetting situations because that’s what people do. Humor is key for us to be able to handle stressful situations. The reason I bring that up is because would I kill my doppelgänger? I sure wouldn’t want to, but if my double was going to kill my children, I think the answer is that I would. MTV News: How different do you think the film’s energy would have been if instead of the horrified rendition of “I Got 5 On It,” playing in the background of the showdown between Adelaide and Red, the original song, “Pas de Deux” from Pyotr Ilyich Tchaikovsky’s The Nutcracker, was played? Abels: It would have been different, that’s for sure. How different though, I couldn’t tell you. The phrase “Pas de Deux,” it comes from classical ballet. It’s a name given to a scene in a ballet that features the prima ballerina and the head male dancer and so they do a duet. The rough translation of “Pas de Deux” is “duet.” The original intention from the script was that the scene would be underscored by “Pas de Deux” from The Nutcracker. There’s a long version of that scene that is scored that way. The idea was that we would use that music, or I was going to make a horror version of that, and it was an exciting challenge that I was looking forward to, but it was clear to Jordan, following the response of the trailer, what needed to be done. He’s a visionary with his own ideas, but he also responds to feedback. I think that comes from his improv comedy background where so much of what people who improvise do is in response to where the audience is allowing them to go creatively. It was clear to him that there had to be some payoff for the response that people were having. So we decided to use “5 On It” as this thing that got twisted for final battle instead of Tchaikovsky, and I think it was a very great choice. Previous articleReaction & debate: Hazard stars for Chelsea – who is your player of the season?